The White House issued a stern warning to Syrian President Bashar Assad on Monday night as it claimed "potential" evidence that Syria was preparing for another chemical weapons attack. Several State Department officials typically involved in coordinating such announcements said they were caught completely off guard by the warning, which didn't appear to be discussed in advance with other national security agencies. Typically, the State Department, the Pentagon and U.S. intelligence agencies would all be consulted before the White House issued a declaration sure to ricochet across foreign capitals. Days later, President Donald Trump launched a retaliatory cruise missile strike on a Syrian government-controlled air base where U.S. officials said the Syrian military had launched the chemical attack. Syria maintained it hadn't used chemical weapons and blamed opposition fighters for stockpiling the chemicals. Russia's Defense Ministry said the toxic agents were released when a Syrian airstrike hit a rebel chemical weapons arsenal and munitions factory. Russia is a close ally of Assad. Earlier Monday, Trump had dinner with Secretary of State Rex Tillerson, Defense Secretary Jim Mattis, National Security Adviser H.R. McMaster and other top officials as he hosted Indian Prime Minister Narendra Modi at the White House. Nikki Haley, the U.S. 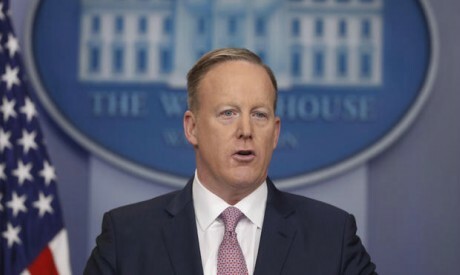 Ambassador to the United Nations, followed up Spicer's statement with a Twitter warning: "Any further attacks done to the people of Syria will be blamed on Asaad, but also on Russia & Iran who support him killing his own people."